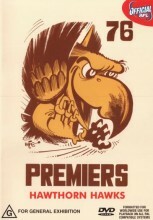 AFL Premiers 1976 Hawthorn DVD from DVDLand. Like North Melbourne and Richmond before it, Hawthorn used defeat in the previous year's Grand Final as its ultimate inspiration the following year. Comprehensively beaten by North the previous season, the Hawks got their chance to exact the most satisfying revenge of all - overturning that result in the biggest game of the season. Hawthorn dominated possession in the first half but had failed to exert the sort of score board pressure coach John Kennedy would have been hoping for. Wasted opportunities in front of goal had been costly and Hawthorn led by only 19 points. Despite the fact that it had squandered opportunities, Hawthorn had put North through a torrid workout. Leigh Matthews had knocked out Keither Greg and Don Scott had been roaming the MCG menacingly. But the testing examination hadn't soured North's appetite for the contest and by three-quarter time the Kangaroos had cut the margin to 10 points. We had ourselves a game. At times like this however the intangibles become a factor and Hawthorn dug deep, rekindling the humiliation of '75 and finding energy reserves which were to overwhelm North. Peter Knights was magnificent for Hawthorn, as was its fleet of little men which had been forced to cope with a revival fuelled by North's midfield. But by the beginning of the last quarter for Hawthorn, with Kennedy's three quarter time address reminding them of the previous season's result, was committed to nothing else less than victory. North had been game, but it wasn't strong enough to cope with Hawthorn's inspired last stanza. Indeed, revenge for Hawthorn was very, very sweet. Click the button below to add the AFL - PREMIERS 1976 HAWTHORN to your wish list.